Not sure about you, but I enjoy watching the Winter Olympics and probably more so than the Summer Olympics. I am a big hockey guy, so I am thoroughly looking forward to watching all-star quality games. I can also confidently admit that figure skating is another favorite of mine along with the skiing and snowboarding competitions. The athletes really are something to watch in their respective sports. Here's to a great 2 weeks of competition in Sochi and good luck to our Minnesota Olympians; there are several! At this point, it seems as if we're in an Olympic competition when it comes to battling the cold this winter and I'm not sure we're winning. As of Friday, the Twin Cities was up to 38 sub-zero nights and according to the National Weather Service it's the most we've seen in 32 years. Interestingly, Friday's sub-zero morning low was the 13th consecutive making it the longest sub-zero streak of the winter season thus far. We warm up a bit today with a quick coating of snow across southern Minnesota. Temperatures plummet once again tomorrow and bottom out by early next week with highs struggling to get to zero on Monday. Fear not, 20s return Wednesday! FRIDAY NIGHT: Increasing clouds, light snow overnight. Low: -3. SATURDAY: Light snow, mainly southern MN. Dusting up to 1" possible. 1" to 2" possible along I-90 in extreme southern MN. High: 14. Wind: Calm turning NW 5. SUNDAY: Brain freeze. More sun and much colder. High: 3. MONDAY: Painfully polar. Wake-up: -16. High: -2. TUESDAY: More clouds, light snow chance? Wake-up: -11. High: 19. 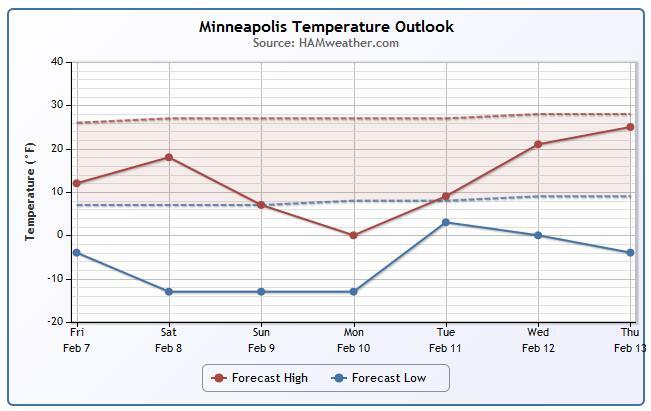 WEDNESDAY: Minnesota heat wave! Clipper arrives. Slight snow chance. Wake-up: 10. High: 28. THURSDAY: Clearing and colder. Wake-up: 12. High: 17. FRIDAY: Another clipper. 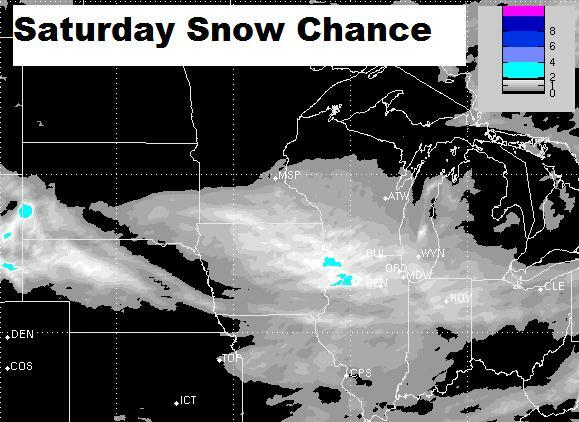 Snow chance late. Wake-up: 3. High: 15. 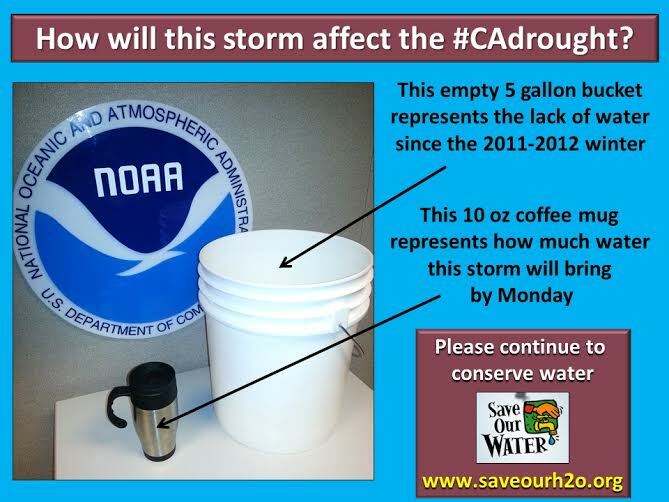 Thanks to the NWS for the graphic and information here. Just in case you want to be reminded of how cold it has actually been... see the information below! 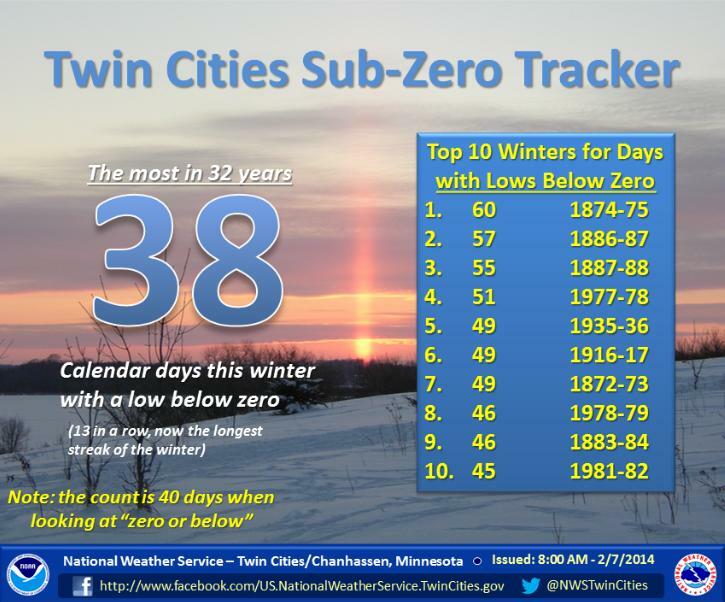 "38 sub-zero lows this winter is now the most in 32 years. Today also marks the 13 sub-zero low in a row, now the longest streak of this winter (a streak of 12 was observed from late Dec. through early Jan.). Both of these streaks are in the top 20 sub-zero streaks on record." Here's the FutureRadar for Saturday as our light snow chance blows through. It doesn't look quite as impressive as it did earlier last week, but we'll get a little nuisance snow across southern Minnesota nonetheless. 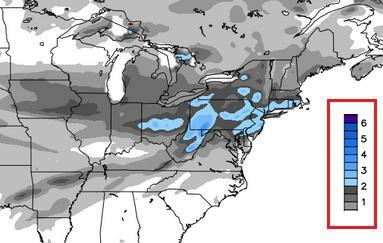 Here's the Saturday snow potential which looks much less impressive than it did earlier this week. Extreme southern Minnesota MAY BE LUCKY to see 1" to 2"... at this point the Twin Cities will likely just see a quick coating. 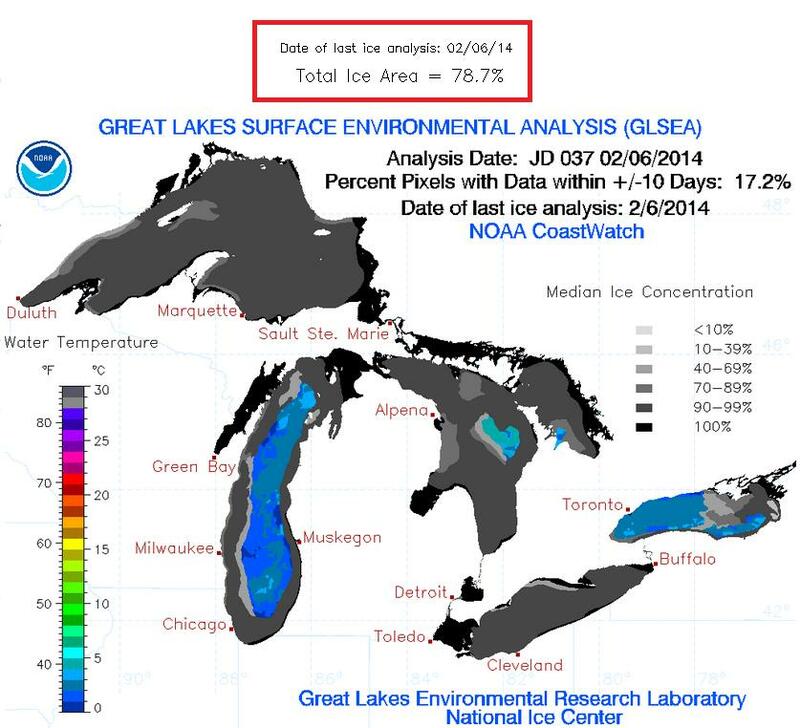 This is pretty impressive... As of February 6th, the Great Lakes ice coverage was nearing nearly 80%! Here's an interesting graphic from NOAA's Great Lakes Environmental Research Laboratory that shows how our current Great Lakes Ice coverage compares to year's past. Note that this year's ice extent is still below the 2 peaks shows below from 1994 (90.7%) and 1979 (94.7%). It is however much greater than the past 4 years and the greatest since 1996! 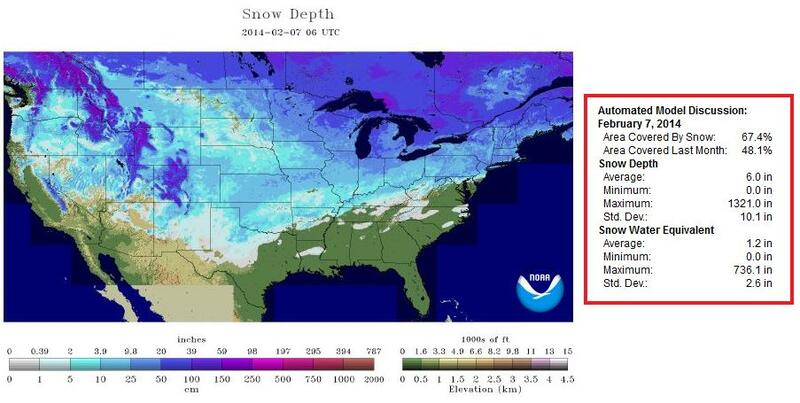 Well how about this, as of Friday, February 5th, the national snow coverage was up to 67.4%, which was the greatest national snow coverage of the winter season thus far! 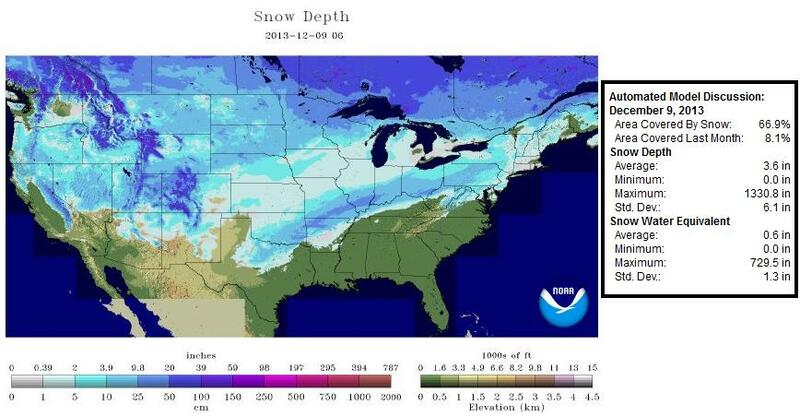 The December 9, 2013 national snow coverage of 66.9% was the previous high mark until Friday. 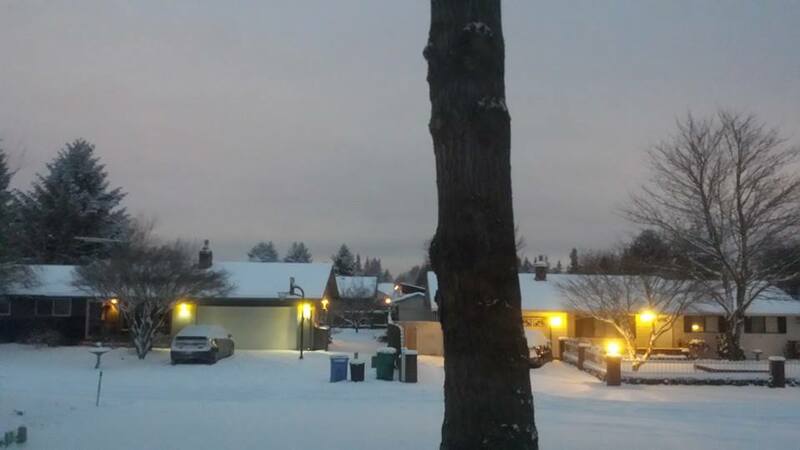 Thanks to Jeremy Hess out of Vancouver, WA for the picture below who woke up to nearly 5" of snow on Friday morning. 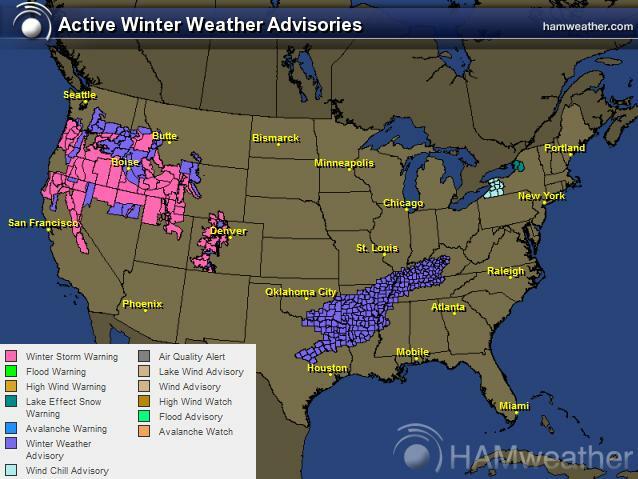 Take a look at all the winter weather headlines that have been posted across the nation, most of which are in the western half of the country. It sure is nice to see moisture return to areas that have been so dry for so long! 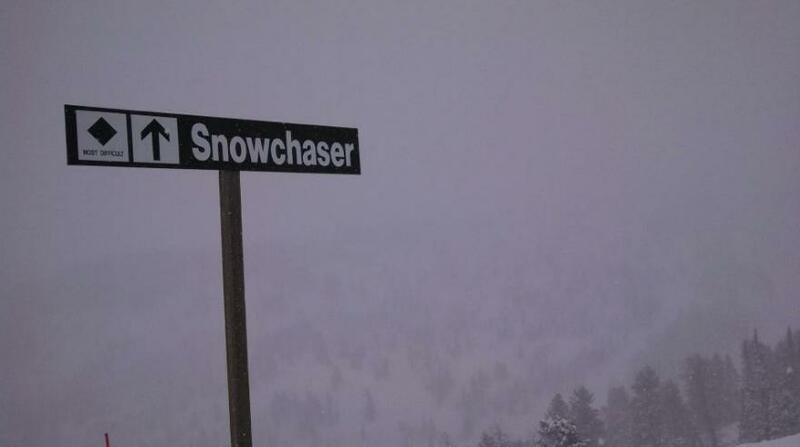 I guess that's the term for great snow! 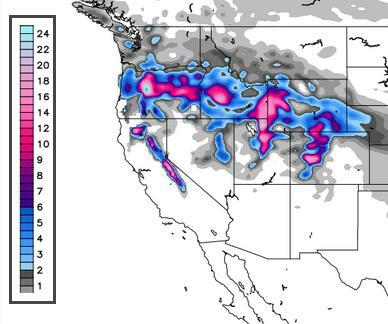 Skiers and snowboarders have been enjoying the recent snowfall at ski resorts in the western U.S.. 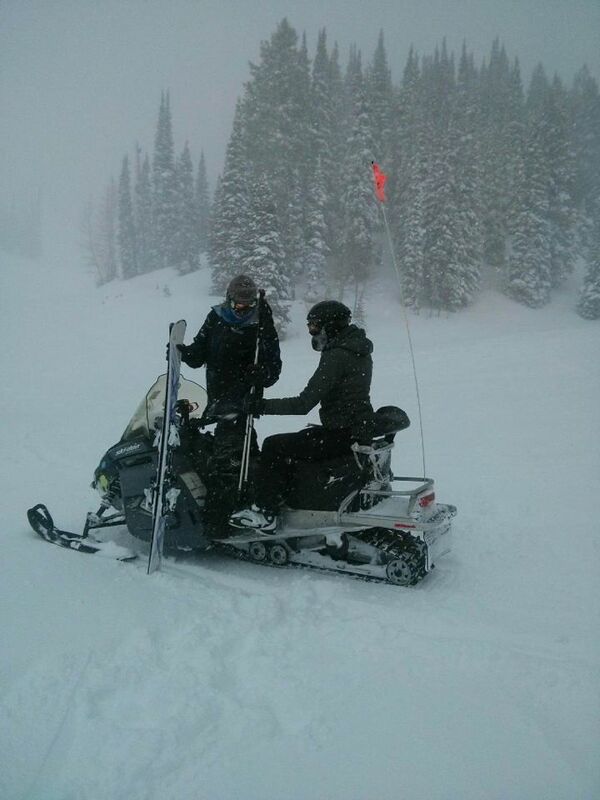 Thanks to my friend Kim Johnson who actually had to be rescued at Powder Mountain in Ogden, UT after the ski lifts were shut down due to heavy snowfall! Looks like you had a great time Kim! Here's the snowfall outlook through the weekend, which suggests 1ft to 2ft possible in some of the higher elevations from the Cascades to the Sierra Nevada. This is promising! According to NOAA's HPC, the 5 day precipitation forecast suggests some fairly significant amounts in the higher elevations across northern California and the western portions of Oregon and Washington! Thanks to the Atmospheric River or Pineapple Express, a continous feed of tropical moisture is feeding right into the western U.S. from Hawaii. Note the finger of more vibrant colors stretching from Hawaii to the West Coast, that's the feature responsible for our recent uptick in much needed precipitation! Take a look at the precipiation over the past 7 days in the western part of the country. While it sure is nice to see moisture return, it's just a drop in the bucket. 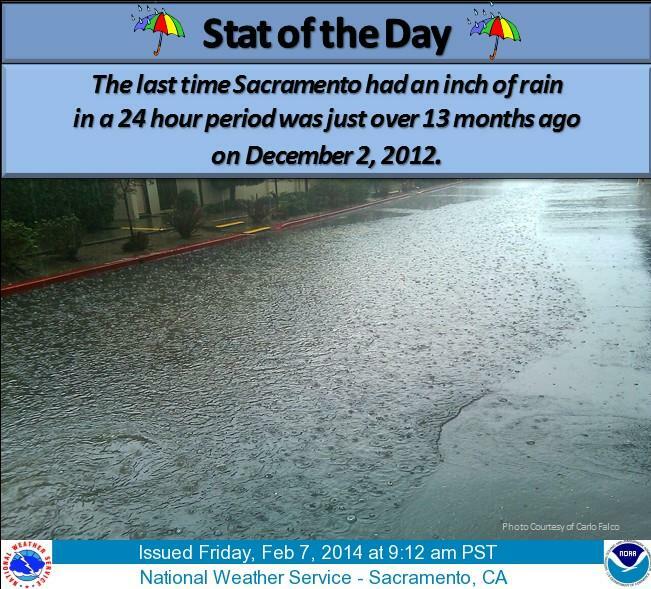 Here's a crazy stat from the national weather service out of Sacramento, CA. The last time Sacramento has seen over an inch of precipitation in one day was more than 13 months ago! 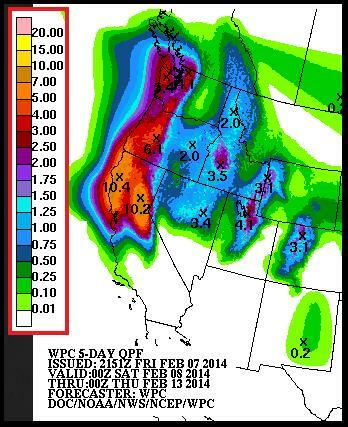 Thanks to the NWS out of Sacramento for this perspective on the weekend precipitation. 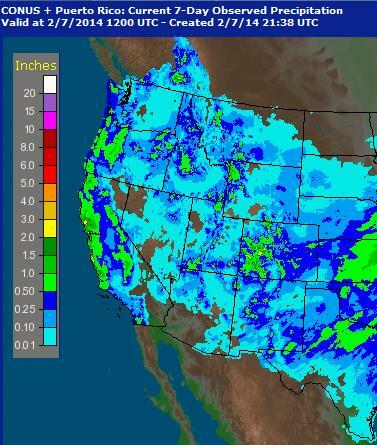 Although we're getting this much needed moisture, we still need A LOT more! Here's the FutureRadar through AM Sunday, which shows a batch of snow moving into the Northeast. Keep in mind that the snow chance over the weekend in the Northeast looks to come in waves. 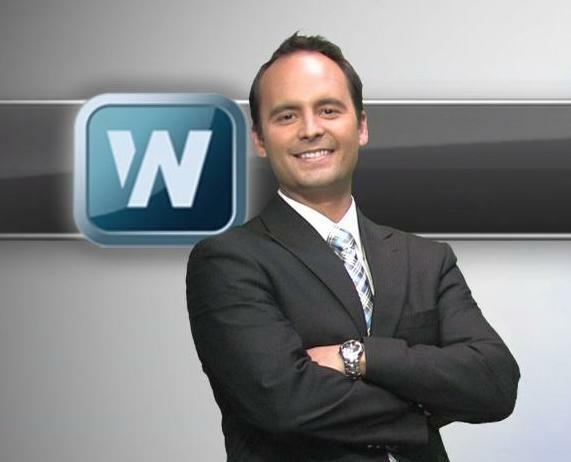 the first will be with us on Saturday, while the second will be with us in the late weekend timeframe. The good news is that the much talked about 'potential' storm in the Northeast for much earlier in the week has tamed down considerably. There appears to be snow accumulations, but much lighter than it looked in some of the doom and gloom forecasts earlier this week. Most of us are connected to social networking websites and at some point you've probably seen somebody post something weather related, right? If you're more connected to the weather community, you've probably seen extended weather tidbits on those social networking websites... here's a great write-up from the National Weather Service out of Sioux Falls, SD about that particular subject. "Plain and simple, the uncertainty is just TOO GREAT this far out in time to give you an exact snowfall forecast for 10 days out. As you move right across the image, look at how the grey dots become more concentrated around the colored dots at days 3, 2, and 1. This represents a consensus that's being formed. 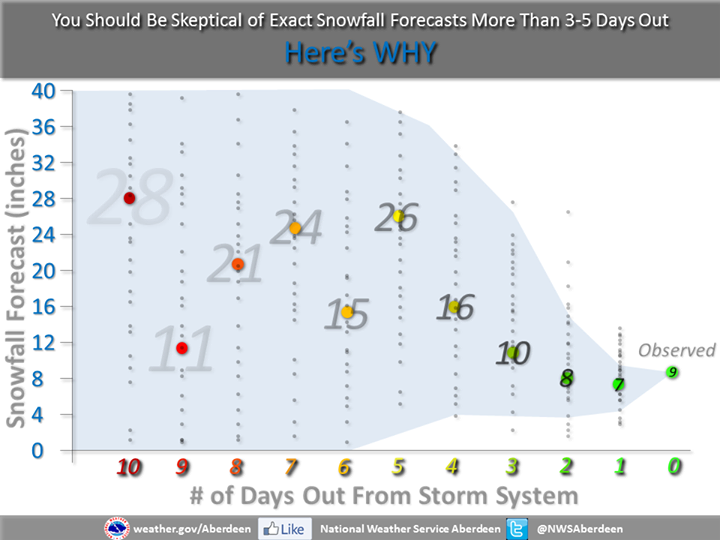 So by the time we are inside of 3 days, we can start to put together a much more meaningful snowfall forecast." Thanks for checking in and have a great weekend ahead!